WordPress.com VIP helped the network of high-profile sports sites unify their code base and platform and move scale, security, and performance concerns out of the way of their ongoing growth and success. A top five sports destination, the USA Today Sports Media Group represents more than half the traffic of the USA Today network overall. 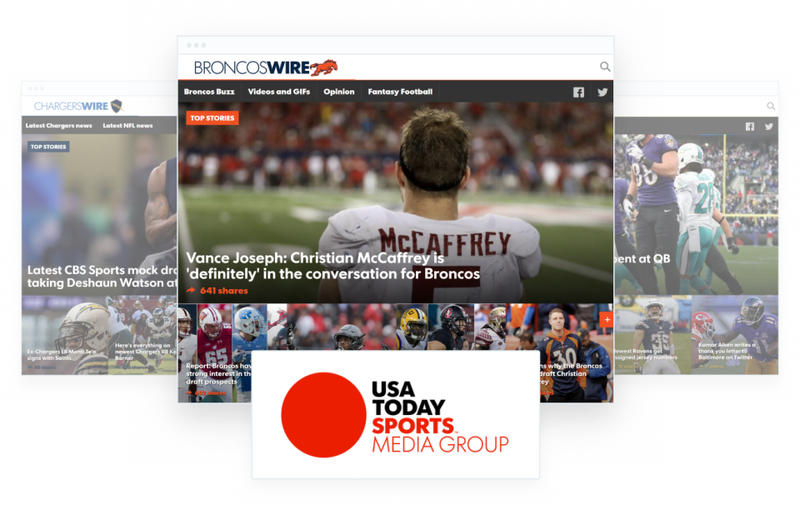 In addition to USA Today’s own sports assets, the group includes For The Win, The Big Lead, Draft Wire, MMAJunkie, HoopsHype, the NFL TeamWire sites, High School Sports, and Fantasy Sports. Most recently, they added GolfWeek to the network in late 2016. Prior to the acquisition of The Big Lead in 2012, the group hosted its sites internally and on self-supported cloud platforms. Each site had its own individual theme and codebase. This created a large amount of technical debt and required the team to spend as much time or more managing and supporting the sites as they did on editorial work, new feature development, and growth. They needed a partner who understood the rigors of content delivery and publishing at extremely high scale and the best practices that can make deployment fast and efficient. USA Today engaged WordPress.com VIP in 2013 and the newly acquired The Big Lead was the first site to be hosted on the platform. The eventual goal was to use its theme to develop a common theme and feature set that could become the backbone for all the sites in the network. As new sites came in through acquisition, they’d be able to migrate them easily, avoiding the addition of entirely new sets of code with each new property. Four years later, as of 2017 VIP hosts and supports 58 sites for the Sports Media Group, all built on that common theme, feature set, and plugins repository. Site editors are able to easily toggle features on and off at the site and group level so that they have total control over each individual property even as they are all centrally supported. When the developers create a new feature for one site, it immediately becomes available to all of them. Thanks to this common setup and the ability to deploy new sites quickly, the group took what would eventually become the NFL Teamwire network from an idea to a single site instance, and then to a popular network of 32 sites, in an incredibly short timeframe. Each follow-on site deployed quickly, fully matches the look and feel of its respective team, and is centrally managed through all of the same tools. What’s more, all of the Sports Media Group’s sites benefit from VIP’s industry leading code review. VIP checks every line of code the developers write, ensuring that it will support the high demands of content delivery at scale. And when USA Today’s developers are planning a new feature or seeking a new integration, VIP’s expert engineers provide architectural guidance from years of enterprise WordPress experience and help them find the best path. VIP also takes care of all of the platform’s operational needs, including security and maintenance updates, performance monitoring, network tuning, and scaling. This frees up the USA Today team to put their resources towards front-end development and growth and steer clear of the headaches of devops. With the success of the Sports Media Group, other high demand sites across USA Today have also moved over to VIP over the years, including one that gets almost all of its record-setting traffic on one day, the USA Today Ad Meter.